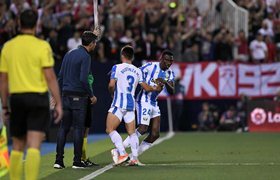 Kenneth Omeruo finally made his full debut for Leganes in their 1-1 draw with Valencia at the Estadio de Mestalla on Saturday evening. The Nigeria international made his maiden appearance in the Spanish topflight before the international break against Rayo Vallecano in a 1-0 win after replacing the injured Unai Bustinza just before the half-hour mark. Omeruo, himself, would later suffer the same fate today as he had to limp off the field in the 70th minute, with his place taken by Raúl García. The central defender's condition will be monitored by Nigeria manager Gernot Rohr, who is expected to announce his roster for next month's crucial Africa Cup of Nations qualifier against South Africa as from the next two weeks. The Chelsea loanee was impressive prior to his injury enforced substitution, raking up six clearances and had a passing accuracy of 94.7 percent, and the most important stat is Leganes were leading 1-0 courtesy of Gerard Gumbau's goal on 63 minutes. Omeruo was a non-playing substitute in the 4-0 hammering of Libya last weekend and was not included in the 18 against the Mediterranean Knights in Sfax four days ago.